At the end of a recent trip to Wyoming, I decided to ramble over to western Nebraska and investigate Scotts Bluff National Monument. I have a couple of short works in progress set in the area and needed to see and smell it for authenticity’s sake. 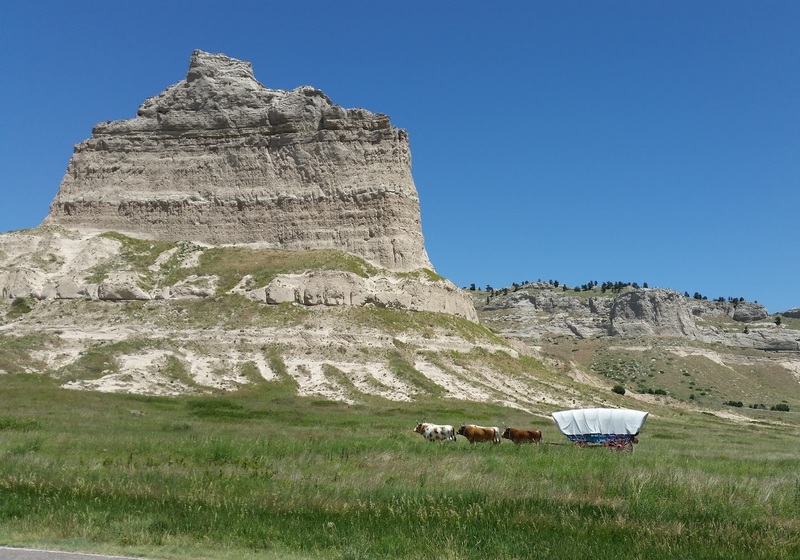 Scotts Bluff, named for a fur trader who died at its base, is actually a chain of sandstone/limestone rock formations covering 3,000 acres and towering 800 feet above the North Platte River. It’s a spot rich in history. 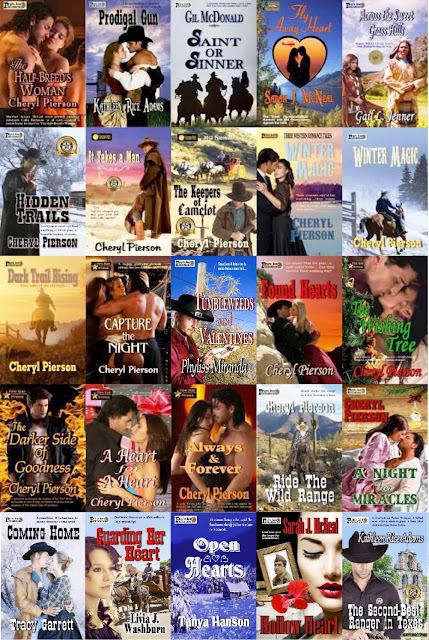 From 1860 to 1861, Pony Express riders thundered by every ten days or so. 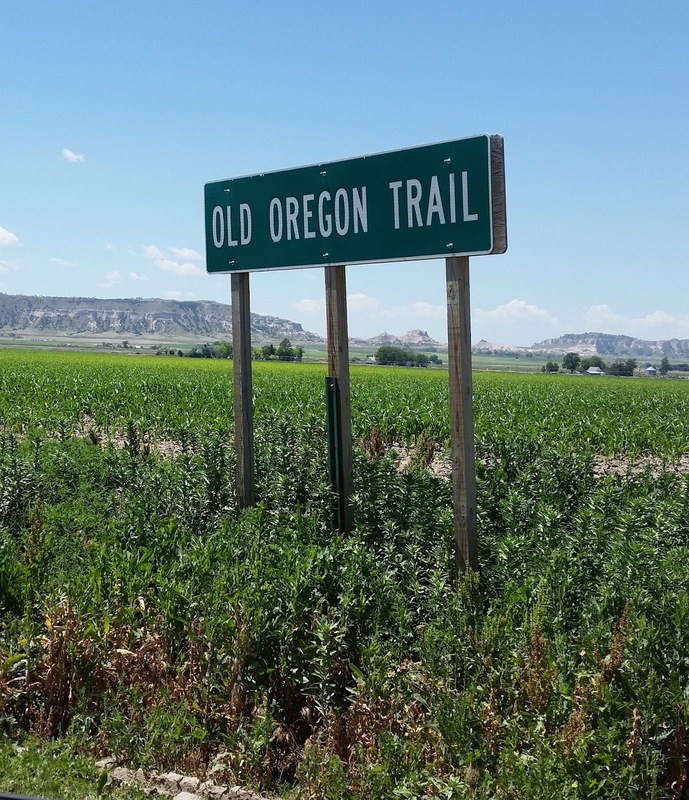 Between 1841 and 1869, some 350,000 people traveling the Oregon Trail squeezed through Mitchell Pass–with only sixty feet of clearance– in the shadow of majestic Eagle Rock, the southernmost peak of the bluffs. 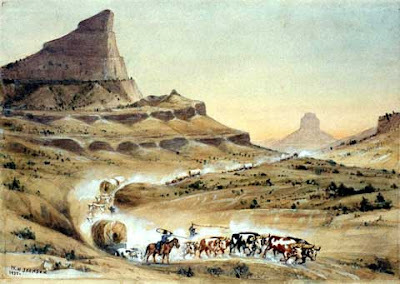 Westbound pioneers would have seen the pale hulk of Scotts Bluff for days before they reached it. It was an important landmark; it meant that they were a third of the way to Oregon and the prairie was about to give way to mountain ranges. It’s interesting to note that Mormon emigrants traveled and camped on the opposite, northern bank of the Platte, to avoid unpleasant encounters with those who opposed them. 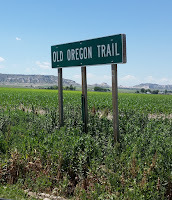 For that reason, the Mormon Pioneer Trail parallels the Oregon Trail for much of its length. 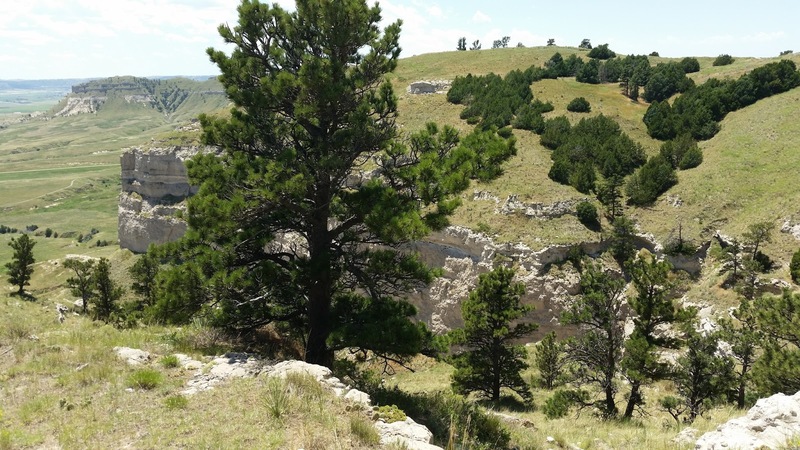 'THE HILL THAT IS HARD TO GO AROUND"
Hiking trails allow visitors a closer look at geological features and vegetation. Numerous overlooks afford sweeping views of the plains and another rocky area known as the Badlands, lesser to those located in South Dakota. The Oregon Trail Museum and Visitor Center, located at the park entrance, provides a wealth of historical and scientific resources, along with some gorgeous oil paintings by noted Western artist William Henry Jackson. While it’s always fascinating to walk in the footsteps of our pioneer forefathers, sometimes the line between present and past feels mysteriously blurred. As I hiked up the rocky trail to the overlook, I stopped to take pictures of a determined little pine tree that had contorted itself into existence in the rocky ground. As its branches swayed in the wind, I heard what sounded like a faraway song…but only for a few seconds. 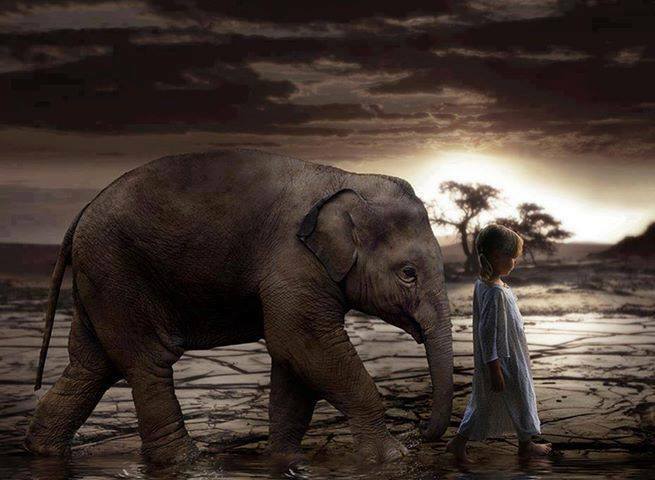 As the breeze ebbed, I heard it again and, this time, it sounded like a chant––a Native American chant. I was sure I’d become weak-minded from altitude sickness, but just as I gave up on hearing the chants, they drifted by once more. I crawled up on a flat boulder and looked eastward down into the valley. I saw a grouping of buildings next to a large grassy park, roughly the shape of a baseball field. It was packed with people…and, even at that distance, I could see that most of them gathered in a circle. The chants drifted up again. A pow wow! 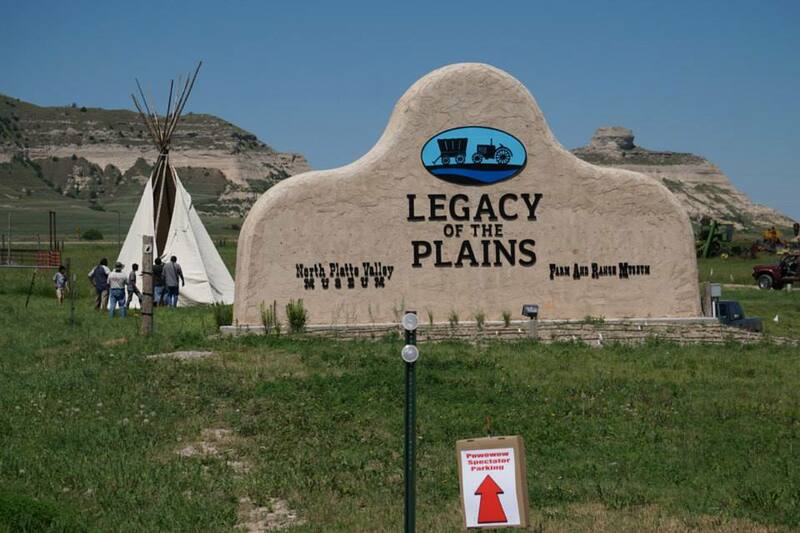 Later, I drove past the Legacy of the Plains Museum and confirmed that my first visit to the summit of Scotts Bluff had coincided with the closing ceremonies of the Lakota tribe’s Circle the Bluffs Pow Wow, or wacipi, as the natives call it. How lucky can a writer girl be? 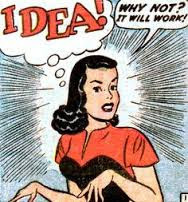 Of course, I left with an overflowing well of inspiration. While I do all my writing from a converted bedroom office in the southeastern United States (at least, for now), I try to make the most of trips out west. Stories emanate from the land and the people of a place. I take hundreds of pictures, talk to locals, and drive down backroads. I have learned the hard way how to identify roads on the map that peter out into gravel. I’ve been known to sneak pine cones and bags of rocks into my carry-on bags. You do what you have do to make the West come alive in your writing! Learn more about Scotts Bluff National Monument at www.nps.gov/scbl. 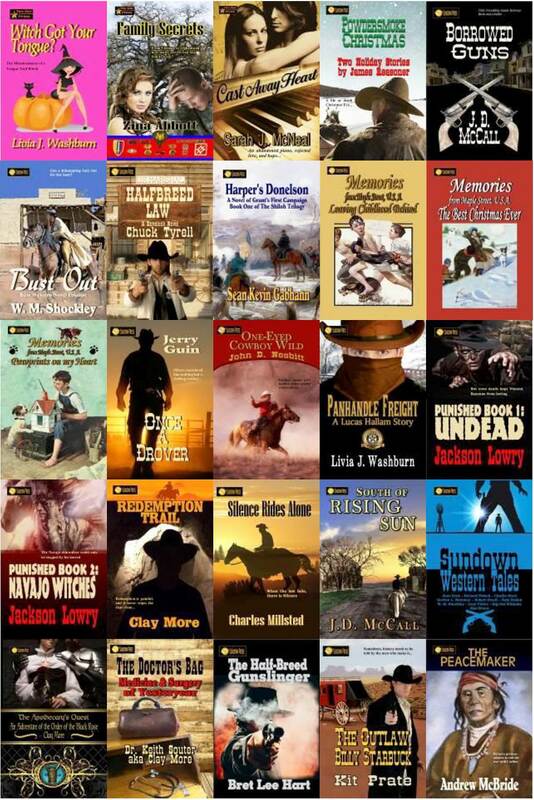 I’ve had a few folks who read my 1930s B-western book series ask me to name the best actors from the old cowboy films. To me, favorite movie cowboys and best western-film actors are two separate categories. One key element that all western films have in common is the battle between good guys and bad guys. And, in the classic B-westerns of 1920s into the ’50s, the good guys wore white hats (except for Lash LaRue and Hoppy) and the bad guys wore black hats. The great character actors who wore black hats and perpetrated dastardly deeds in many western films were usually the best actors. People like Charlie King, Myron Healey, I. Stanford Jolley and Barton MacLane appeared in countless films as delightfully wicked scoundrels. 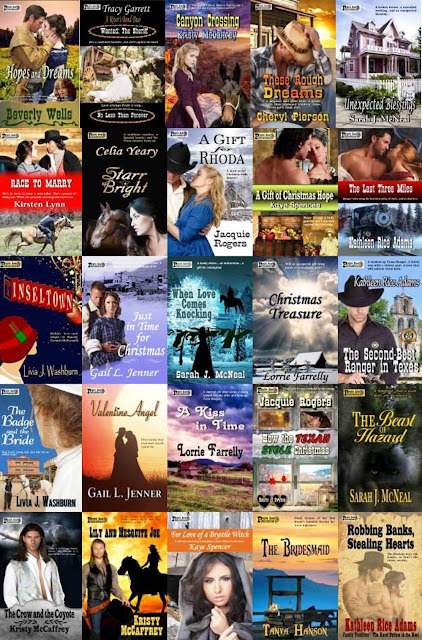 Where the white-hatted heroes were strong, handsome and, usually, quite stoic, the villains were able to mug for the camera and chew scenery while carrying out their evil attempts to steal the ranch, rustle the cattle, rob the bank or force the schoolmarm into an unwanted marriage. The King of the Black Hats was Charlie King. His bushy black mustache and deep Texas accent made him a popular rascal in close to 400 motion pictures during his career. Although he appeared primarily as a villain, King also played a variety of parts in oaters, including comedic roles. 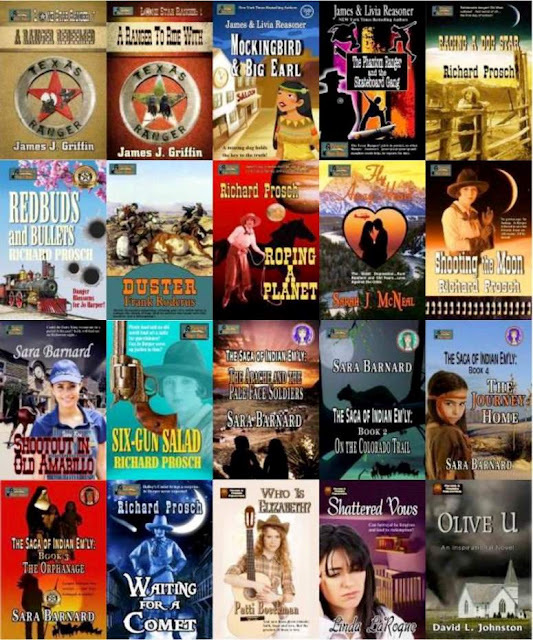 Virtually every B-western hero (Ken Maynard, Hoot Gibson, Tex Ritter, Bob Steele, Lash LaRue, Buster Crabbe, etc.) engaged in memorable on-film fistfights with King. Myron Healey’s bad-guy characters were usually clean-shaven. But young audiences began to recognize his villainous smile as a sure sign he was up to no good. Healey landed his first scoundrel roles post-war at Monogram Pictures where he faced off with Johnny Mack Brown, Whip Wilson and Jimmy Wakely, and also wrote screenplays for some of the films. 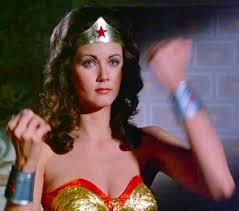 That led to a long career in television and motion pictures. Barton MacLane was another great character actor who became known for his cowboy villains. During his career, which lasted from the ’30s into the ’60s, MacLane also successfully portrayed gangsters, cops, military officers, newspaper editors and protective fathers. His recognizable face can be found in B- and A-feature films as well as television. He worked with Humphrey Bogart, Randolph Scott, the Marx Brothers, Glenda Farrell and other greats in films with singing and non-singing cowboys, pirates, Dr. Jekyll, the Mummy and Jeanie from the I Dream of… series. Although his name isn’t often recalled, I. Stanford Jolley, whose acting career lasted from the ’20s into the ’70s, is instantly recognizable as a western villain. He portrayed all kinds of characters in motion pictures and television, yet his look personified the mustached black-hatted blackguard who would shoot a preacher in the back for the coins on his plate. 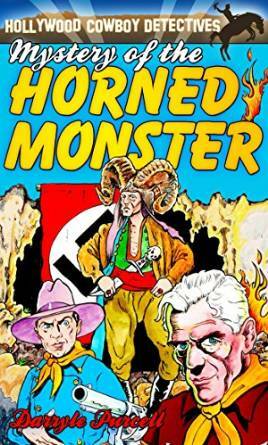 Young matinee audiences would begin hissing the minute he appeared onscreen and then break into a cheer at the end of the film when the white-hatted hero dispatched him to his un-heavenly reward. Mr. Jolley’s family and friends have remembered him as one of the kindest men in the business. Now that’s a real actor. The classic cowboy stars of the past could not have existed, let alone been so heroic, if it were not for the wonderfully evil black hats who were out to get them. One of my favorite writers is Fredric Brown. 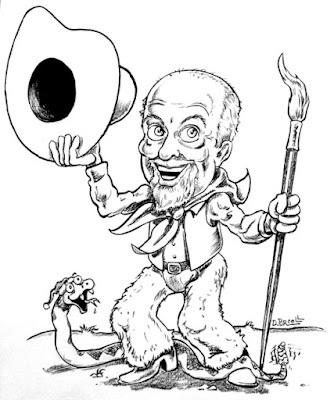 Brown wrote mostly crime and science fiction stories and is well known for his detective novel The Fabulous Clip Joint and his SF story, "Arena," which was adapted for the original Star Trek TV series. But Brown is also famous for his flash fiction. Known in his day as short-short work, a typical Brown piece of the sort might fill only half a page. Or, as in his story "The End," the same story might appear on the top of the page, only to repeat--backwards--across the bottom. 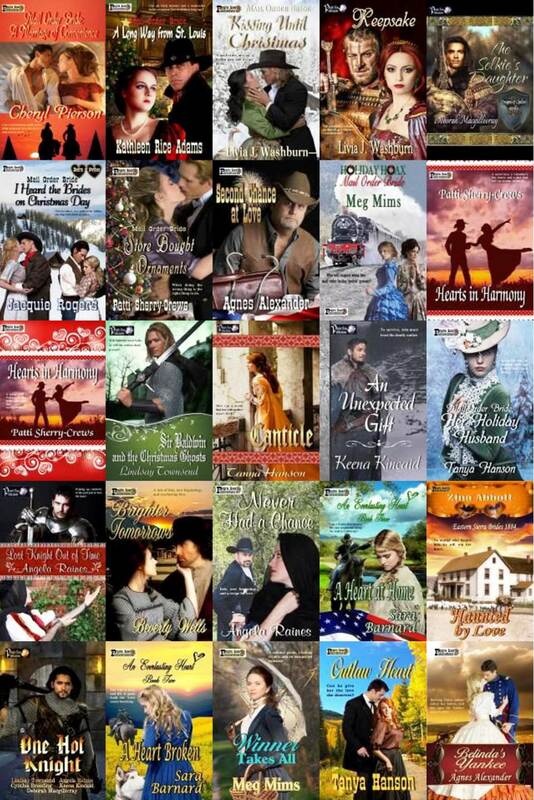 Meanwhile, in a couple months I'll be releasing a collection of my Holt County novellas and stories. 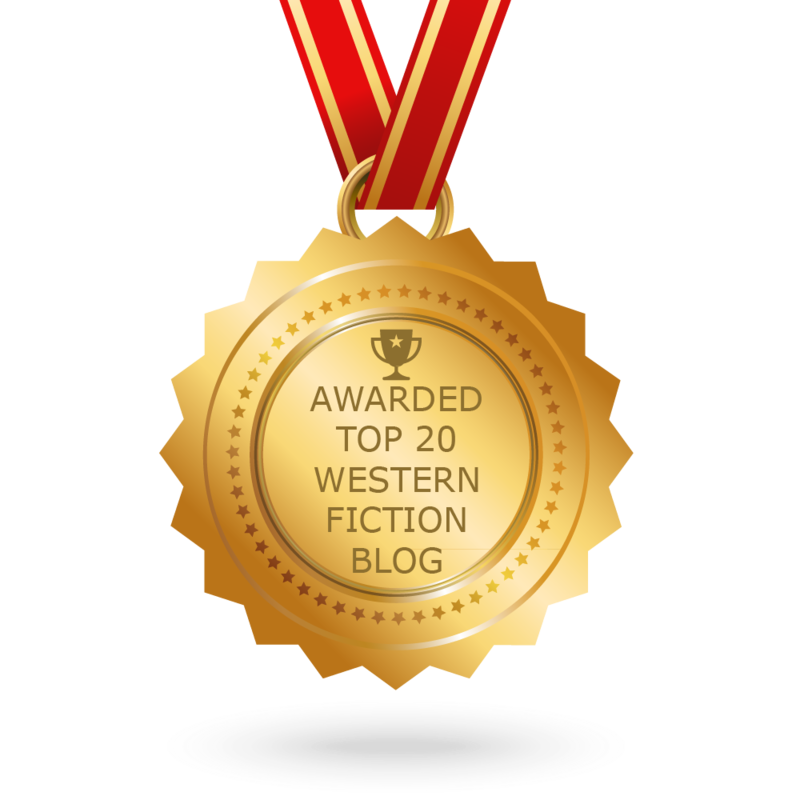 Deputy sheriff Whit Branham is one of my favorite western characters, so I thought it was appropriate that with a new collection soon coming, I'd let him take center stage in a short-short piece of fiction. The result is "Abram's Wife." I wrote this in two sittings. The first draft, typed out at the local deli with a tumbler of iced tea and an '80s pop soundrack weighed in at close to 1,600 words and took two hours. I brought it home, mulled it over, and cut around a third of that, added a bit more, and within another 30 minutes had the final story of Around 1,300 words. Please read "Abram's Wife" here. Hey everyone! Please help us celebrate our fantastic third birthday “bash” at Prairie Rose Publications! 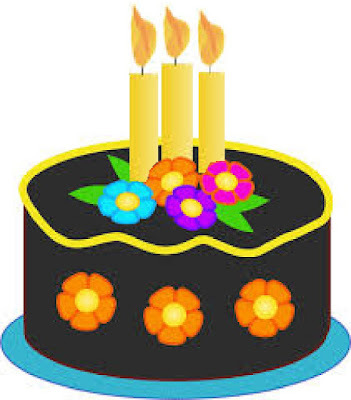 Yep, this month marks the “big date” for us when we became a company and actually set our dreams into motion. 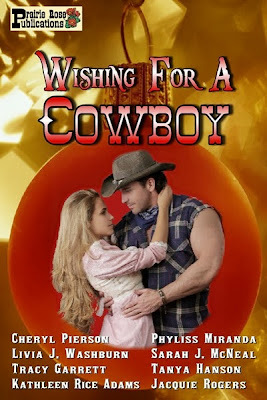 From our very first publication, WISHING FOR A COWBOY, that made its debut in October 2013, to the present, we have strived to bring our readers the very best stories we could lay our hands on. And, we hope we’ve brought happiness and fulfillment to authors in all stages of their careers—from the newbies to the well-seasoned—who have all joined us and become part of the PRP and Imprints family. 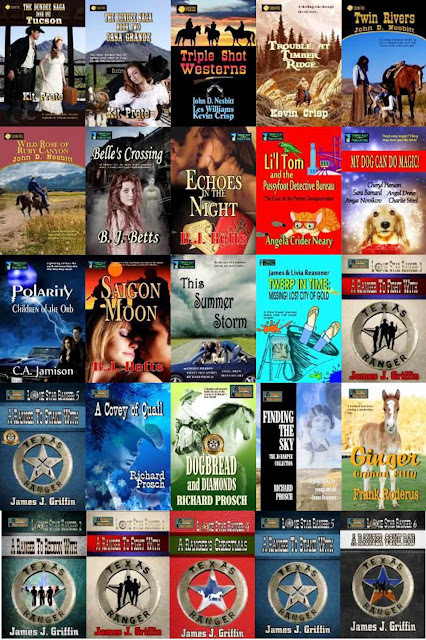 Over the past three years, we've expanded to SIX imprints, and have published hundred of novels, short stories, novellas, and boxed sets and anthologies--and we have loved every minute of it! Our authors work hard to bring their characters and stories to life for readers, and our team at PRP has enjoyed these past three years immensely—I love reading and editing the submissions I receive and coming up with new ideas for boxed sets, anthologies and series. 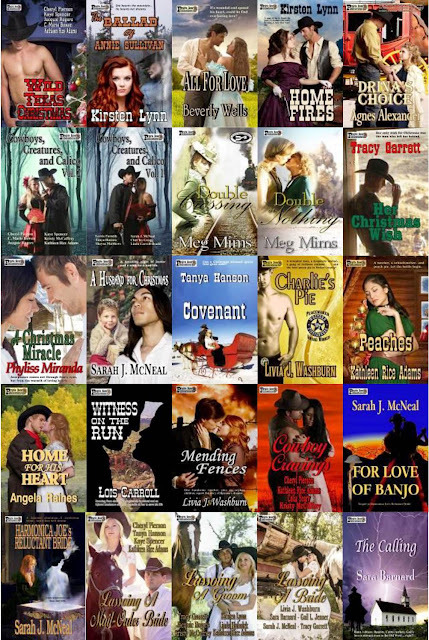 Livia and I, along with Kathleen, hash and re-hash what we think would be fun ideas for our authors to participate in, and we’re always open for submissions when our authors come up with their own fantastic tales. ...NOT a mild mannered author-type at all! Do you recognize her in this picture? Livia, Kathleen, and I love working together and think so much alike about so many things that it’s easy to “move along” with plans and ideas we have. 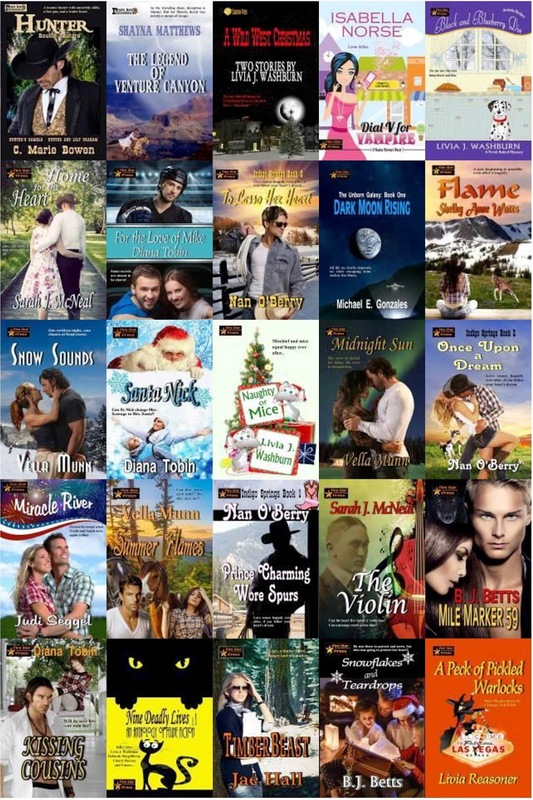 We wanted to celebrate our third birthday with some new releases, sales, and prizes. 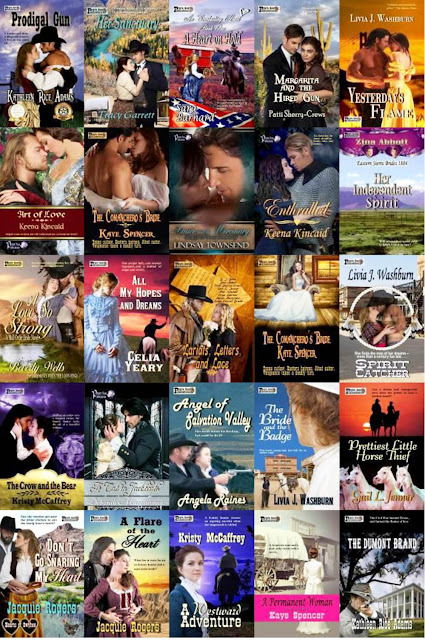 So please join us every day at the PRP blog through the 19th of August for a variety showcasing of the talents of our many wonderful authors! We will be doing giveaways, so be sure to leave a comment with contact info on our blogs—your name COULD BE the one we pick! And you're certain to find some fantastic new books to add to your library, no matter what! 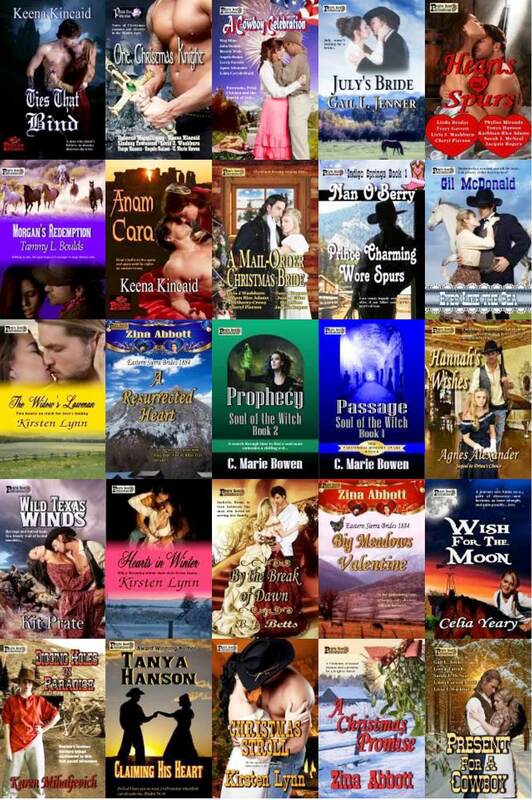 Just take a look at all these wonderful stories, waiting to be read! Here's our link! Time proved the best ally of con men who roamed the wide open spaces of the Old West ready to spin their creative schemes on all gullible segments of society. The families who headed for the frontier usually made the rough journey of four to six months with all their possessions plus an average of about $1,000 in cash—considered a sizable amount of the time since wage earners usually brought home only a few dollars a week. 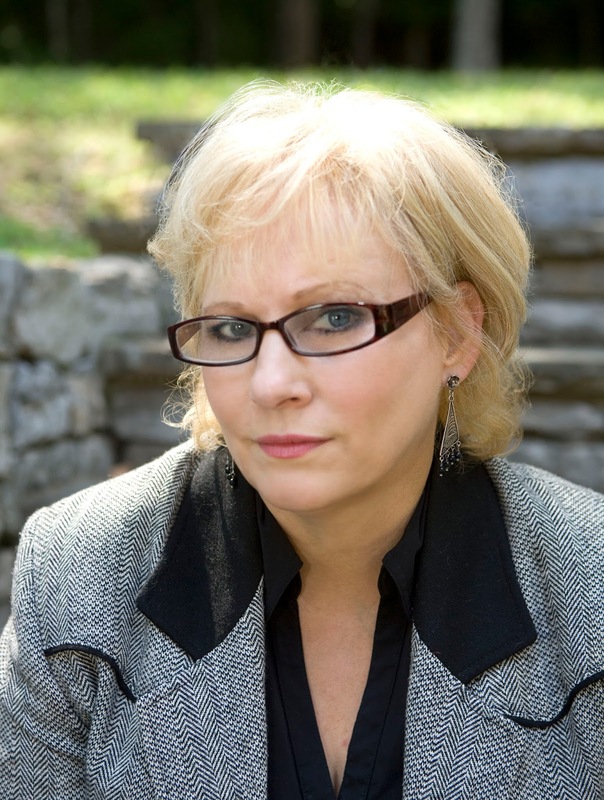 Hucksters and swindlers awaited the unsuspecting like hungry vultures poised to swoop in for the kill. No one was immune: farmers, soldiers, merchants—anyone who had a buck or two or more for the taking. Warnings or alerts about these tricksters traveled at a snail’s pace and usually never reached the frontier until pioneers and others fell victim to con men again and again. Con men were as prevalent as bars of soap throughout the American West. Soap, incidentally, served as the core of one successful swindle. 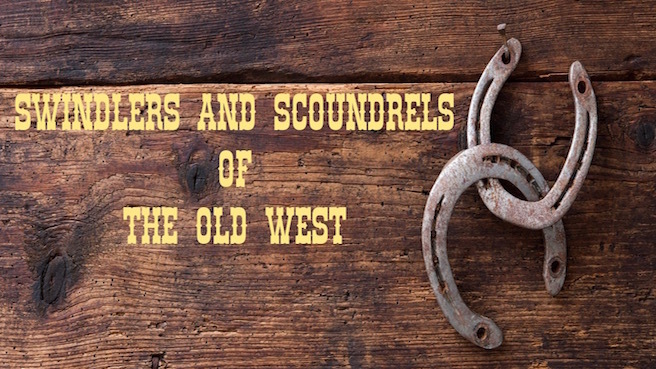 Although it’s impossible to identify all the con men who traveled the Old West, here are three who made a successful living fooling the unsuspecting. 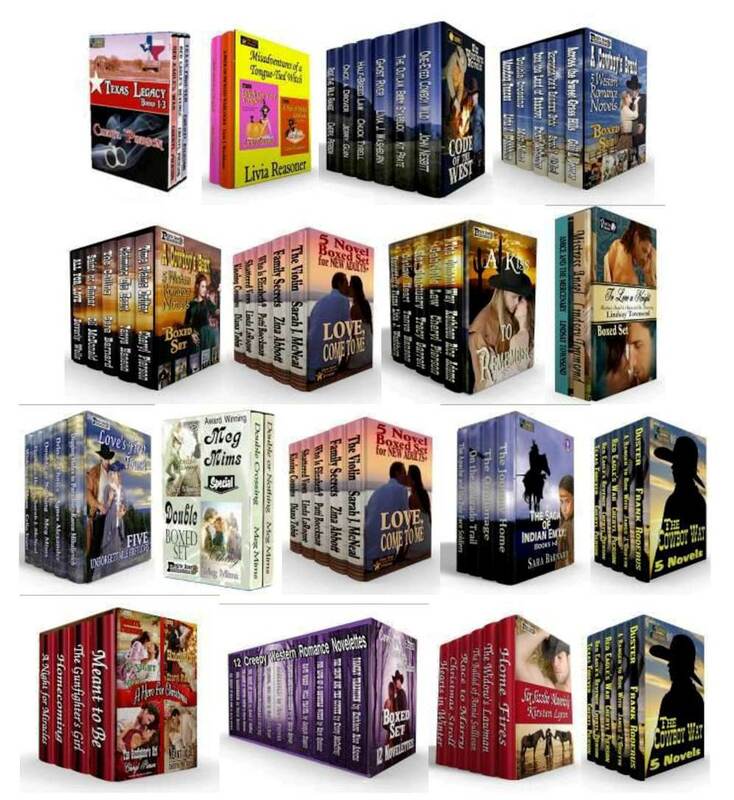 A crowd gathered on a busy street corner in Denver stood spellbound as the man in the dark suit and flat-brimmed hat balanced his valise on a tripod stand and opened it to reveal stacks of ordinary soap cakes wrapped in plain paper. Jefferson Randolph Smith II took out his wallet and removed paper bills in denominations of one dollar to $100, wrapped them around several of the money-wrapped soap bars, and mixed them with the others. At that point, he offered to sell the soap for $1 to $5 a bar. A few individuals in the crowd—accomplices of Smith, known as the Soap Gang—quickly bought the soap packets. After ripping away the wrapping, they excitedly displayed the $100 bills, bragging aloud voices they had pulled a fast one on the soap man and beaten him at his own game. Enticed by the success of these shills, others in the crowd anted up the cash to buy their packets—all which contained only soap, valued at about a nickel. 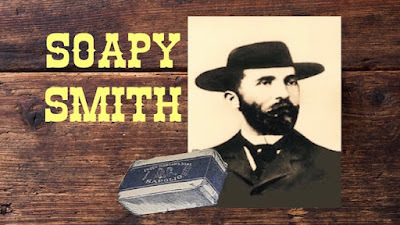 The scam gave birth to the con man’s nickname—Soapy Smith, who continued the hoax over a twenty-year period. The “Prize Package Soap Sell Swindle,” as a Denver newspaper dubbed it, proved child’s play compared to the overall criminal pursuits of this American con man. 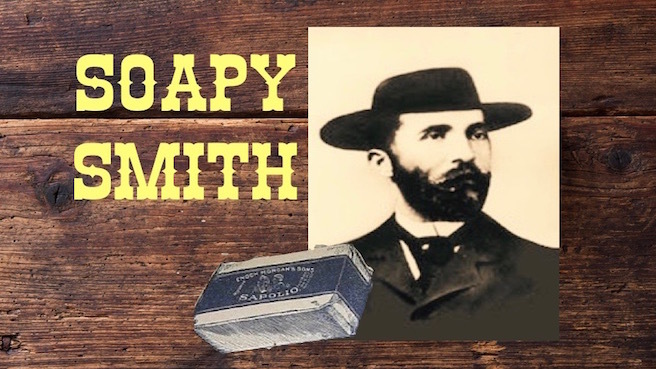 Between 1879 and 1898, Smith played a significant role in the operation of organized crime in Denver, and in Creede, Colorado. Smith’s last con, bilking a Klondike miner out of a sack of gold, cost him his life on July 8, 1898, in what’s known as the Shootout of Juneau Wharf. The crowd gathered around the man in the derby hat, and stylish clothes reacted with surprise when he flashed a big smile and snapped open his umbrella, even though he was indoors. 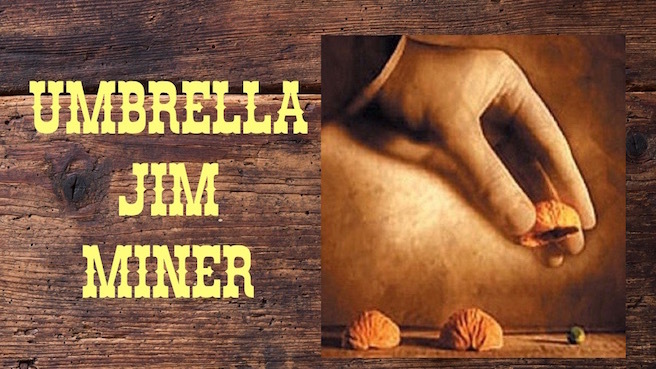 “Gather 'round, folks, for a chance to double your money,” announced Jim Miner, also called as Umbrella Jim, one of the slickest of Mississippi shell game artists, a master of the short-con. Miner operated under a simple strategy: Get in. And get out. Not only did he start his infamous shell-and-pea game by opening his umbrella—rain or shine, indoors or out—he immediately segued into a ballad for his eager onlookers and then launched the con. Miner smiled and placed a small round ball, the size of a pea, under one of three walnut shells and quickly shuffled them around the tabletop. “Who can guess where the little pea is hiding? 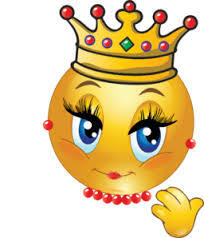 Double your money,” he announced, reeling out just enough inducement to convince the daring to wager on the location of the pea. In reality, the only big winner would be Jim Miner. The game had nothing to do with chance. While those who placed bets stood wide-eyed and focused on the back of Miner's hands, they couldn't spot the slight-of-hand wizardry he used to remove the pea between his thumb and second finger. On occasion, he allowed someone to win, purely to squeeze higher bets out of the mark. And every crowd included someone who believed he was smarter than the game. No one playing had the ability to pick the right shell unless Miner—or another operator—wanted someone else to win. 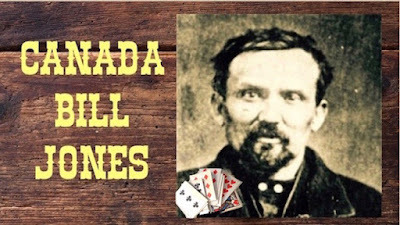 "Suckers have no business with money, anyhow," said Canada Bill Jones, one of the most capable card sharps in history. Born in Yorkshire, England, in the early 1800s, Jones immigrated to Canada when he was about twenty and mastered three-card monte, which is not a game but a scam or swindle. After several years of fleecing suckers in Canada, he crossed the border into the United States and took his game to the pre-war south where he conned passengers on Mississippi riverboats out of enormous sums of money. Jones attributed much of his success to playing the rube. He spoke in a squeaky voice, draped baggy clothes over his 130-pound frame, and came across as a bumbling greenhorn, a klutz that few people took seriously. But, that's where they made their mistake. Jones was anything but klutzy. He was a master of the con, and a renowned poker cheat. After the Civil War, he and his card-sharp partner, George Devol, decided to ply their trade on the railroad, targeting passengers who were heading West at the beginning of the country's ambitious expansion. The pair enjoyed so much success that Canada Bill wrote the general superintendent of the Union Pacific Railroad offering to pay between $10,000 and $25,000 a year for the exclusive right to operate a three-card monte on the trains. Bill promised to fleece only “the wealthy, and Methodist ministers.” Not surprisingly, the railroad declined to accept the offer. Among his most ardent admirers were other gamblers. When Canada Bill died in 1880 in Reading, Pennsylvania, he was penniless. Dozens of his peers showed up at his funeral and raised money to repay the city for the cost of burying Bill, and to erect a gravestone in his honor. 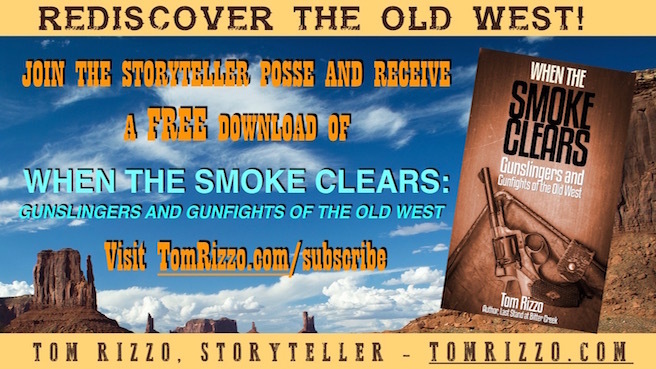 Tom Rizzo invites you to “Discover the Historical West” and read about characters and events that shaped the American frontier. Join the StoryTeller Posse and receive occasional dispatches from the High Plains and beyond and receive a FREE copy of "WHEN THE SMOKE CLEARS: GUNSLINGERS AND GUNFIGHTS OF THE OLD WEST. "